For earlier editions, visit my main page. If you have trouble importing your projects into Eclipse, your computer might be automatically unzipping the downloaded file. In Eclipse's Import Projects dialog, please try choosing Select root directory instead of Select archive file. I found a discussion about this problem at http://www.java.net/forum/topic/jdk/java-se-snapshots-project-feedback/failure-install-mac-os-x-1068-documented-7u4-b11. You can try tweaking your files as described in these comments. You can visit http://jdk7.java.net/macportpreview/ and download the version of Java 7 (for Mac) that was available when I wrote the book. It should be fine for most programming purposes. You can install Java 6 instead of Java 7. 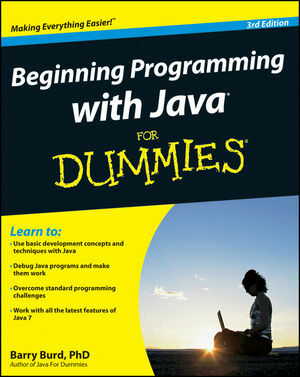 Most of the examples in my book will work with Java 6.